However, when faced with the challenge of fitting years of accumulated stuff into a space that’s a quarter the size, it’s easy to come undone. In this article, we’ve put together some cool ideas for maximising every inch of your new small space home, to help you make it more liveable and drive up its value. Before we even start talking about cool storage ideas, you’ll want to get tough on yourself and get rid of the stuff you don’t need. Consider a garage sale or selling it on eBay. Once you’ve paired it back to the things you can’t live without, you can start thinking about incorporating clever storage solutions into the design of your home. Stairs are a hidden bonanza of wasted space that you can reclaim in a variety of different ways (check out these imaginative ideas on Buzzfeed). Another great tip is to use space vertically, not horizontally – that means thinking of creative ways to make use of your wall and ceiling space instead of the floor. For example, try creating personality with floating wall shelves. Use your furniture as extra storage Multifunctional furniture is also a great idea – look for a coffee table with a shelf under it for books, or one that converts into a desk. There are plenty of beds and sofas available with hidden storage underneath, and you can position attractive storage baskets to hide your clutter. Want to get even more creative? Consider a vertical wall bed that transforms into a revolving bookcase. Or this wall bed that converts into a home office or study. If you love your garden, think vertical! There are plenty of fun ideas on Pinterest for small spaces and balconies, from pallet herb gardens to exotic-looking cactus displays. Click here for inspiration. Why not tuck your washer and dryer away inside a kitchen cupboard and reclaim the laundry for a different use? You might even like to include a fold-out drying rack and ironing board into the design for ultimate efficiency. Another option is to combine your bathroom and laundry into one, so that you can optimise the use of the plumbing. You could remodel the toilet and go for a wall-hung throne. By concealing the tank in the wall, you’ll save space and achieve a more modern look. When it comes to the bathroom, recessing cabinets and installing a pedestal basin will free up room. Another tip is to use neutral colours and larger mirrors to create the illusion of space. Call us about financing your reno! 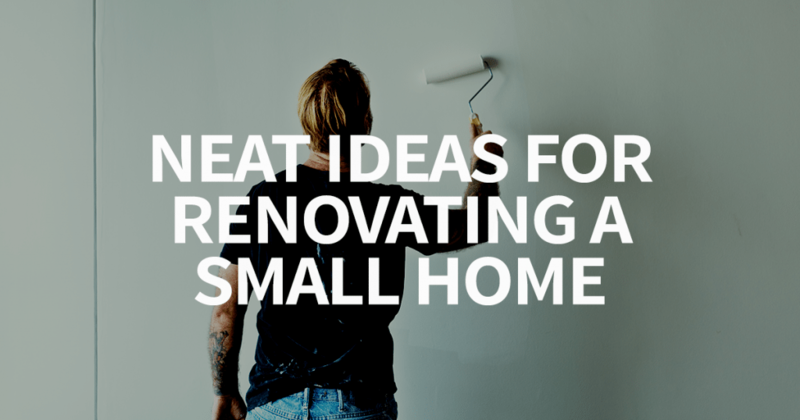 Renovating can do wonders to improve the liveability of a smaller home and boost its value – we hope these ideas help with your plans. If you’d like to know how you can finance your renovation dreams, please get in touch. You may be able to refinance and use the equity in your home, or you may benefit from a home loan with features such as a line of credit. There are all sorts of other finance options available, so talk to us and we’ll help you set the wheels in motion for your renovation project.